I found a new book for my classroom that I can't wait to share with every single class, and it is absolutely perfect for Music In Our Schools Month too (but really would be great any time of year)! I don't know why I didn't hear about this book sooner, but I'm so glad I found it and I hope you all enjoy these lesson ideas as much as I am. This post may contain affiliate links, which will not affect the purchase price or buying experience but will support this blog. 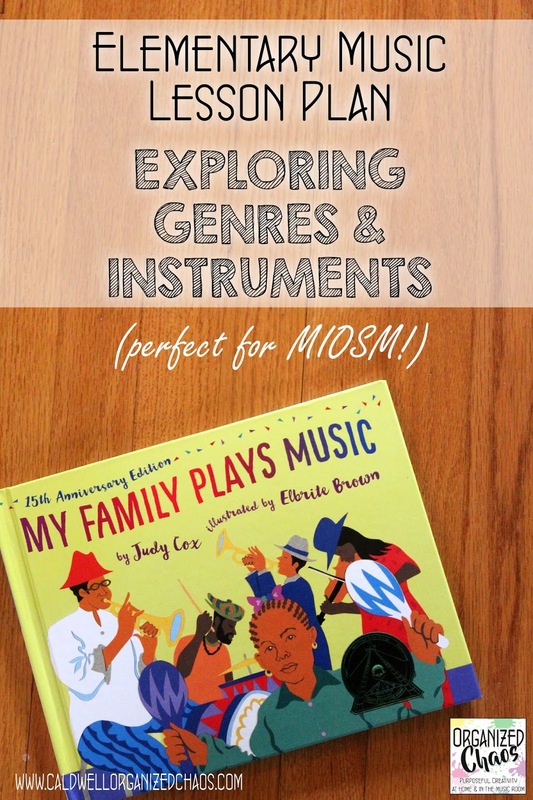 My Family Plays Music by Judy Cox is a beautiful book about a young girl who comes from an diversely musical family- from a great-grandmother who plays organ at church to an aunt who plays vibes with a jazz combo (and everything in between). 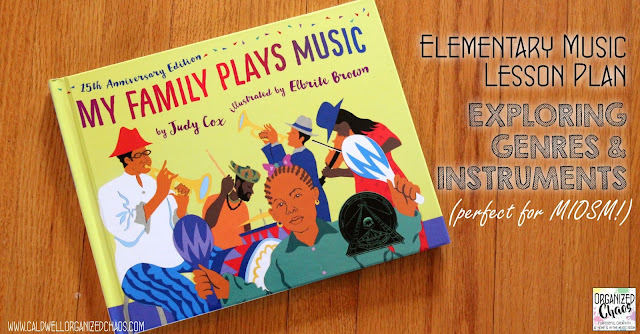 On each page, the girl introduces us to a family member and the music they play, and shares a classroom percussion instrument she likes to play with each genre. The book features people of all ages, gender, shades, and sizes, and of course a wide range of musical genres. The MIOSM theme for 2019 is "All Music. All People". What could possibly be a more perfect fit for this book than that?!? 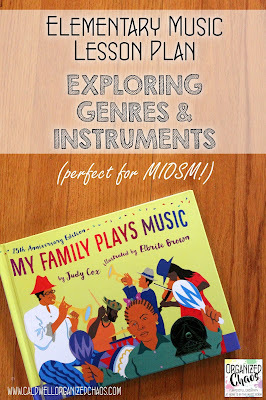 I am planning to use this lesson during the month of March this year to explore and celebrate the variety of musical genres and ways we can participate in music-making, no matter who we are. "...And when we get together, we celebrate!" That's when we'll watch this rendition of "Celebration" and dance along with the music. After finishing the story, we'll review the genres and instruments we read about and have a discussion about which genres and instruments (either from the story or otherwise) we enjoy and why. Then we'll talk about how different people can enjoy different styles, and the variety of ways that we can make music in our lives. Then we'll talk about how all the different children around the world came together for the song in the final video, and how the family came together to dance at the end of the story, and we'll practice having the whole class play together on their different instruments (for kindergarten I'll have them all play the same rhythm together, 1st-4th grades can layer one instrument in at a time on different rhythm ostinati, and the oldest grades can come up with their own patterns for each instrument). 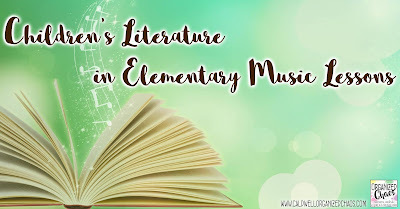 There are so many musical concepts you can address through this lesson: musical genres and instrument names, names and playing techniques for classroom instruments, musical elements (through the discussions about genres etc), performing and/or creating rhythm ostinati, and rhythm reading (if you have students read a rhythm from notation for their play-along patterns). Most importantly, it is such an accessible and engaging way to expose students to a wide range of musical genres, musicians, music-making opportunities, and instruments! Have you ever used this book in your classroom? This book was first published in 2003- why in the world am I just now discovering it?!? If you have used it before I'd love to hear how you used it in your music classroom- leave a comment below. I hope you get some fresh inspiration to use during your Music In Our Schools Month celebrations or any time of year! I love this book and use it every year! I use it when we've learned all the UPP instruments and review them, and then do listening ID game with the symbols. Each student (1st grade) gets an instrument as I call them out in the book. Then we read the book and they play when I read their instrument name. They really like it. It's a lot of fun! Such a fun way to review the instruments, for sure! For the younger grades it might be more realistic to just focus on those rather than including all the different recordings of the genres as well, as that will definitely add a lot of time to the lesson. Happy to help! ;) So glad you like the idea too- I can't wait to try it myself this month!! This looks great, I need to get this book. I'm curious, at which grade level do you personally show the videos. I agree that the younger kids would be fine with UPP playing and review. Thanks for sharing. I would show these to any of my K-6 grades (with the caution to start midway through on that first one, as mentioned in the post)! It helps bring the genres to life I think.